How can I find people and information? Discover new information tailored to you in your Home view or find what you're looking for through views such as My work and Shared with me. You can also find information through people or search. Each view is a collection of content cards that have something in common. On your Home view you'll see information based on what the Office graph thinks is most interesting for you right now. How does Delve know what's relevant to me? The My work view lets you see the documents you've modified recently. Under Shared with me, you'll find documents that have been explicitly shared with you in TE102751708. Click the name of a view on the left to open that view. Below the view names on the left, you see some of the people you're connected to in the organization or people you work with across teams. Click a person's name or picture to open their people page. You'll see documents they're working on or documents trending around them. 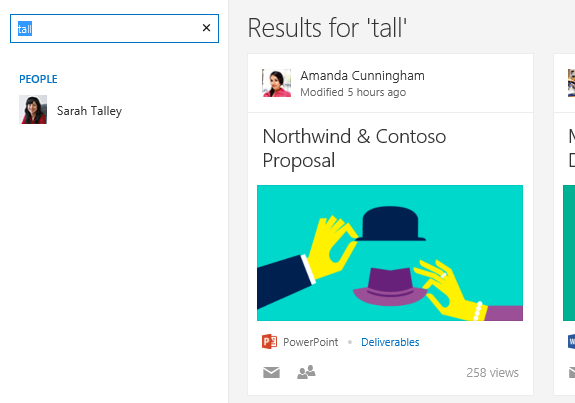 If you're looking for that one document you know your colleague is working on, you'll likely find it on his or her people page in Delve. 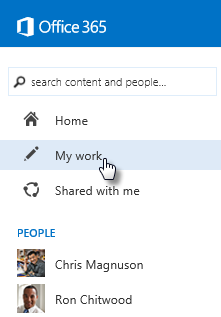 To see what other people are working on, go to their page by searching for their name or by clicking their name or picture anywhere in Delve. Start typing in the search box to filter people or documents. You'll be able to find people or documents in your Delve views and in your organization's Delve views. What kind of information will I find in Delve?